SiteRanker has important information available about the site you are visiting. 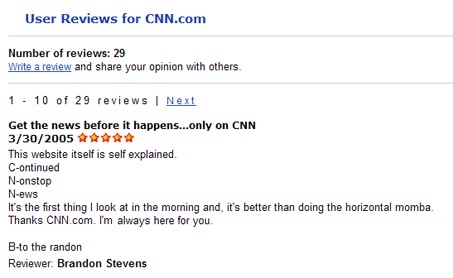 The "Add Your Review" link allows you to share your opinion on the website. 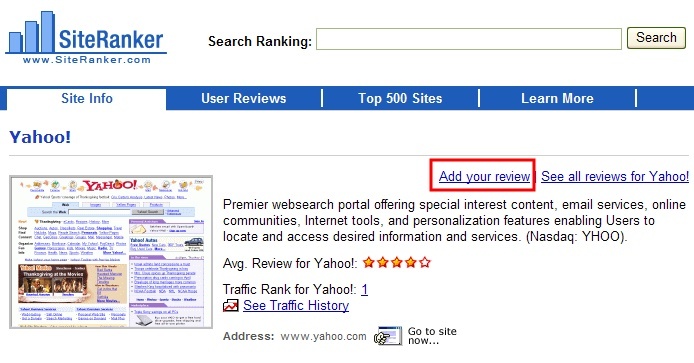 The "See all reviews..." link offers opinions about the website from others. 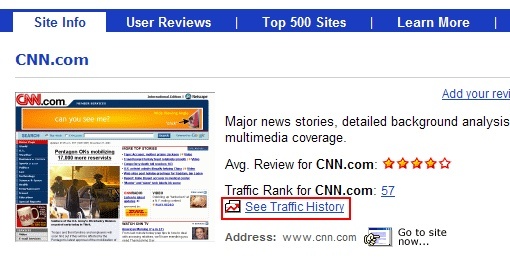 Traffic History provides an interesting insight into upward or downward daily traffic rank trend experienced by the website. This is compiled during the most recent one to three month period of traffic activity. The "Compare to..." search field dynamically generates a graph comparing traffic rank activity of the site being visited to another site that you specify. today, 1 week average, 3 months average and 3 months change. "Scope for..." shows percentages in 4 key time periods: Today, 1 week average, 3 months average, and 3 months changea key indicator of upward or downward visitor activity. Scope measures the number of Internet users visiting a particular site. SiteRanker measures scope as number of users per million. As such, the numerical ranking reflects the percentage of users, per million, visiting a particular site. 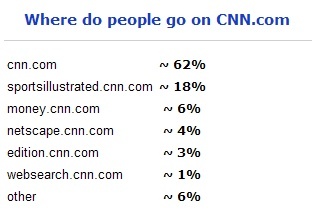 E.g., cnn.com has a scope of 1.34% - meaning an average of 13,400 (per million) users visit this site. Scope rank presents scope rank based on data accumulated over these reporting periods: Today, 1 week average, 3 months average, and 3 months change.